Mix the sugar, flour, seeds of the vanilla pods, baking powder and orange zest, start adding the eggs and then the nuts. Put the dough onto a non-stick baking tray and cook for 30 minutes. When the dough has a golden colour set on a side for a couple of minutes to slightly cool down. Cut very long and thin slices from the dough and place them back onto the tray, bake for a couple more minutes until dry but don’t allow to darken too much. Keep on a side to cool down completely. Bring a pot of water to the boil then turn down the heat. Put the egg yolk in a bowl, add the sugar, Marsala and start to whisk. Place the bowl on top of the pot not allowing it to touch the water. Keep whisking until you obtain a fluffy and foamy mix. 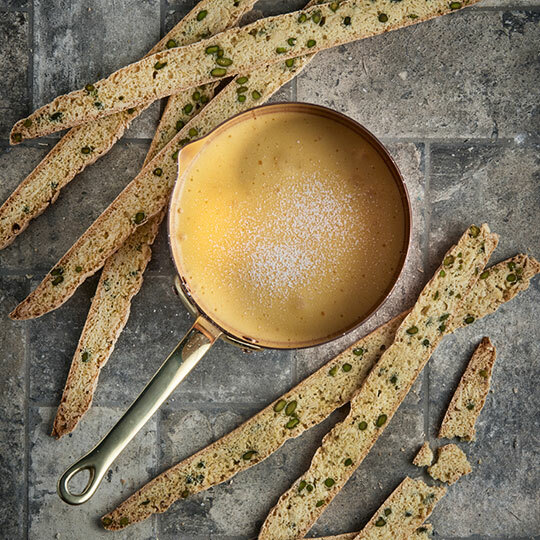 Pour the zabaione in a glass and serve with the cantucci biscuits.